Bill Clinton and Al Gore at a 1996 campaign fund-raiser. Twenty years ago today, the film Primary Colors was released in theaters, disappointing audiences who expected something more than John Travolta and Emma Thompson doing their best Halloween-costume versions of Bill and Hillary Clinton. But it’s hard to imagine anyone queueing up for the movie could have been anywhere near as excited by the story as they were two years prior. For the better part of a year in 1996, the juiciest political story in Washington—one that caught fire and roared through front pages of national papers, endless reams of gossip-column ink, and talk shows from The Tonight Show to Face The Nation—wasn’t any of the scandals of the Clinton administration. It wasn’t the unending media circus that would eventually envelop Clinton’s second term, when the Monica Lewinsky affair was revealed. 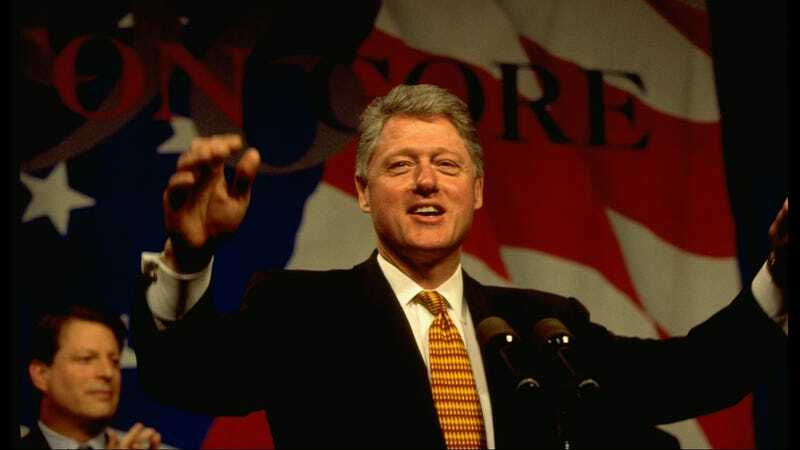 It wasn’t Whitewater, or welfare reform, or Vince Foster, or any of the other dozens of tempests that were always roiling around the beleaguered but wildly popular Democratic president. It was a novel that purported to be a thinly disguised portrayal of the 1992 Clinton campaign—and its author was Anonymous. Before the book was even released, the hype was gaining momentum. Primary Colors was rumored to be an uncannily accurate roman à clef of the behind-the-scenes goings-on during the difficult campaign of then-Governor Clinton and his loyal staff. Narrated in the first person by a sharp aide who bore quite the resemblance to real-world staffer George Stephanopoulos, it depicted in impressive detail any number of events and people with clear true-life counterparts, from the Clintons themselves to political consultants like Paul Begala to a deliciously vicious send-up of then-New York Governor Mario Cuomo. The story followed the idealistic young staffer as he helps a Southern governor, Jack Stanton, navigate a brutal primary campaign and weather ongoing scandals based in part around the politician’s appetite for younger women. As he begins to realize the depth of the candidate’s amoral drive to win at all costs, he undergoes perhaps the world’s most awkward case of buyer’s remorse, as he watches his complicity help elect a man who looks more and more willing to sell out his principles for the highest bidders—or a few more votes. The idea that it was written by someone with high-level access to the campaign proved irresistible, for the simple reason that it was the ultimate navel-gazing parlor game for the very groups that could most ensure it became water-cooler conversation: journalists and politicians. The book was a perfect mix of political-insider exposé and media-baiting “guess who?” wedded to a story of corruption every bit as compelling a page-turner as a John Grisham novel. But unlike Grisham’s work, this one promised to pull back the curtain on the most famous couple in the country and reveal their true behavior for all the world to see, a nigh-impossible tease for just about anyone interested in the Clinton White House, whether seeking confirmation of the ongoing tabloid fodder provided by the president’s accusers Gennifer Flowers and Paula Jones, or cynical pols looking to have suspicions regarding Clinton’s sliding-scale principles confirmed. Some of the novel’s scenes, based on meetings between then-Governor Clinton and his campaign confidants, are rendered with such dead-eye detail “that you think, ‘Who was in that room?’ because they seem so creepy,” said Mr. Clinton’s former media adviser, Mandy Grunwald. The hunt was ubiquitous; as someone in his teens in the Midwest at the time, I can confirm that people and places you normally never saw engaging with either politics or literature considered it as common a topic as the previous night’s Seinfeld episode. Everyone wants to feel like they’ve scored access to an inner circle, privy to the secrets and prevarications of people in power. Especially for a president as polarizing as Bill Clinton, the desire to look behind the cool and charismatic media figure everyone had seen countless times, and find out whether it was an act, is a strong incentive. (That the book was genuinely an addictive beach read, accessible to anyone, made the conversation even easier to join.) That masterful inflammation of the popular imagination by the book’s publicity campaign, along with its anonymous-author hook, created a blockbuster. Newsweek tallied it up: After 19 printings totaling 1.2 million copies and 20 weeks on the Times’ bestseller list (nine of them at No. 1), the paperback rights were sold to Warner Books for $1.5 million. Warner’s initial printing ran to 1.5 million copies. Rights were sold to 21 foreign publishers. Mike Nichols claimed film adaptation rights for more than $1.5 million. All told, the mysterious author stood to profit roughly $6 million from the first-year earnings alone. But the savvy and secretive author wasn’t unknown for long. The eventual reveal of Anonymous’ identity, when it came, was a letdown, the way that any whodunit inevitably ends with an answer far less entertaining than the question. “My name is Joe Klein, and I wrote Primary Colors,” began a mea culpa by Newsweek journalist Klein, like he was presaging the final scene of Iron Man. After nearly six months of speculation, during which Klein loudly and repeatedly denied he was the author, he was forced to come clean after a handwriting sample was discovered on an early manuscript of the book, and the sample was matched to Klein’s own. But it’s also just a damn-good story. As much a superlative con job à la Orson Welles’ War Of The Worlds or P.T. Barnum sideshow as it is media-criticism footnote, the tale of an embedded senior aide in a momentous and attention-getting presidential campaign unveiling the lurid secrets of a smooth politician and his marketing machine is a compelling narrative. It was a right-place, right-time marvel, and doesn’t have to portend some darker future of both politics and media. We got to that place just fine without Joe Klein.